The New Zealand Football Championship (known as the franchises jointly run by Winter clubs. It is currently sponsored by ASB Bank. There are two stages to the competition; "The League" (commonly referred to as "regular season") and "The Championship" (commonly referred to as "the playoffs"). The two teams that win the league phase (the "Minor Premier") and the Grand Final (the "champion") qualify for the OFC Champions League. Should the same team win both the Minor Premiership and the Championship, the second Champions League spot is granted to the league runner-up. This has occurred on numerous occasions; the first instance being in 2006 when Auckland City (premiers and champions) and YoungHeart Manawatu qualified despite Canterbury United contesting the Grand Final. There are no lower divisions in the Premiership, thus no promotion and relegation exists, similar to leagues in Australia and in the United States. At the regular season stage, there are currently nine teams, with each club playing the others twice. Due to the uneven number of clubs, each team has two byes in the season. At the end of the regular season, the top four teams progress to The playoffs. For the first four seasons, regular season had the teams play each other three times, however, this was changed to the present 14-match system in 2008, due to financial difficulties affecting some of the clubs. The playoffs are run as a home-and-away semi-finals series, with the winners progressing to a one-match Grand Final. The playoff phase in the inaugural season was contested by the top three clubs, whereby the Minor Premier (winner of league phase) received a bye and hosting rights for the grand final, with second and third placed teams playing off in a one-game preliminary final. The NZFC experimented with a five team playoff in the 2005–06 season, however, this was discontinued and the league reverted to the three-team playoff system for the 2006–07 and 2007–08 seasons. The New Zealand Football Championship was created as a replacement to the former New Zealand National Soccer League, a tournament involving clubs from the regional governing bodies of New Zealand Football. 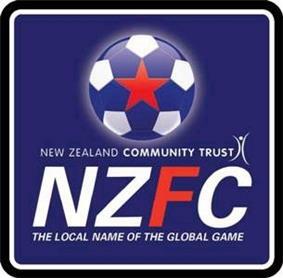 The NZFC was to be run as a summer league involving new clubs created solely for the new competition, with these new clubs being run jointly by existing winter clubs. The only exception to this was Napier City Rovers, whose summer club would be rebranded Hawke's Bay United during the second season, to be operated jointly by other clubs in the Hawke's Bay region. Eleven groups bid for franchises, with the successful bids being announced on 7 April 2004 as Auckland City FC, Canterbury United, Napier City Rovers, Otago United, Team Wellington, Waikato FC, Waitakere United and YoungHeart Manawatu, with Olé Madrids, East Auckland and Team Bay of Plenty being excluded. Unhappy at their exclusion, the Olé Madrids bid team took New Zealand Soccer to court, suing for damages and demanding inclusion in the competition, claiming that, whilst they met NZ Soccer's criteria for inclusion, other successful bids did not. The case was dropped by the Madrids team eight days before the commencement of the first NZFC season. Western Suburbs, the club associated with the Olé Academy, is now a principal member of the Team Wellington franchise. East Auckland also considered legal action, however this was not pursued. The first match of the competition was on 15 October 2004, with Auckland City defeating Napier City Rovers 3-1 at Park Island, Napier. Auckland City were also crowned the inaugural NZFC champions after defeating Waitakere United 3-2 in the final. The second season saw Napier City Rovers rebrand and re-organize their NZFC team as Hawke's Bay United, forming an amalgamated franchise with other local clubs. It also saw the first instance of a NZFC team winning the O-League, with Auckland City FC defeating French Polynesian team AS Pirae 3-1. At the conclusion of the 2006-07 season, New Zealand Football granted three-season license extensions to seven of the eight franchises - all but Gisborne, one from North Shore City, and two from Manukau. Olé Madrids also applied for the license, however they withdrew early. On 2 September 2010, New Zealand Football announced a five-year sponsorship agreement with ASB Bank resulting in the rebranding of the New Zealand Football Championship to the ASB Premiership. In 2013, after a review of the competition by the ASB Premiership review committee, YoungHeart Manawatu was dropped from the competition after finishing last in the previous three seasons. New Zealand Football also confirmed that a team composed of New Zealand players born on or after 1 January, 1995 would take Manawatu's place in the Premiership for at least two seasons. The addition of the team - to be known as Wanderers SC - was to provide adequate preparation for New Zealand's U-20 players for the upcoming 2015 FIFA U-20 World Cup which will be hosted by New Zealand. Much confusion surrounded the initials "SC" in the Wanderers' name, as no official explanation was given as to what they stood for. It wasn't until after their first match that coach Darren Bazeley finally revealed that "SC" stood for "Special Club", saying "it acknowledges this team has arisen out of a special situation and was specially formed for the purpose." The 2014-15 season saw the Premiership expand to nine teams for the first time in its history. Wellington Phoenix Reserves was added to the competition to provide game time for the members of the Phoenix squad who are not playing frequently for the first team in the A-League. Restrictions were also put in place for all clubs requiring that at least 50% of match day squads are players who are eligible to play for the All Whites. After 11 full seasons, only Auckland City FC and Waitakere United have been crowned Premiers or Champions, with Auckland City adding their sixth premiership and sixth title in the 2014-15 season. There are currently eight clubs from New Zealand playing in the 2015–16 ASB Premiership. Unlike most European leagues, there is no system for promotion and relegation. This system is similar to leagues in Australia and in the United States. The teams that win the league phase (the "premier") and the Grand Final (the "champion") qualify for the OFC Champions League. Should the same team win both the Premiership and the Championship, the second O-League spot will be granted to league runner-up. The Golden Boot is presented to the player who scores the most goals during the season. The 2010-11 season saw the introduction of the ASB Challenge Series. This was an individual friendly competition in which the eight Premiership teams competed against a reserve team attached to Wellington Phoenix FC, a New Zealand based team playing in the Australian A-League. The ASB Phoenix Challenge was discontinued after the 2010-11 season but reinstated for 2012-2013. For the 2012-13 season the competition was expanded to 10 teams with the Nelson Falcons competing in the southern conference and Northern U17's connected to the New Zealand national team in the Northern conference. The OFC Champions League, also known as the O-League, is the premier football competition in Oceania. It is organized by the OFC, Oceania's football governing body. It has been organized since 2007 under the current format, following its successor, the Oceania Club Championship. Two teams from the ASB Championship participate annually. Four O-League titles have been won by teams from New Zealand. The White Ribbon Cup, is a knockout cup competition run by New Zealand Football. The 2011-12 season will be the inaugural season of the NZF Cup. It was established in 2011 to provide regular football for the six clubs not participating in the Oceania Champions League and runs in conjunction with the ASB Premiership regular season. Referees are selected from around New Zealand and occasionally include guest referees from other nations, most notably Australia. Whilst the match referees may travel to games outside their home federation, assistant referees and fourth officials are from generally within the hosting federation. ^ "REGULATION 10: NATIONAL LEAGUE" (PDF). NZFootball.co.nz. Retrieved 31 July 2015. ^ "Black year for New Zealand after All Whites loss". Access My Library. 29 December 2004. Retrieved 15 June 2010. ^ Brown, Michael (14 February 2005). "National service". Official Team Wellington Website. Herald on Sunday. Archived from the original on 22 October 2008. Retrieved 15 June 2010. ^ "New soccer franchises revealed". TVNZ. 6 April 2004. Archived from the original on 16 May 2011. Retrieved 15 June 2010. ^ "Five chase NZFC licence vacancy". Sports Web. Archived from the original on 25 July 2011. ^ "NZF signs its biggest sponsorship deal". Stuff.co.nz. 2 September 2010. Retrieved 12 November 2014. ^ "Manawatu dumped from ASB Premiership". TVNZ. 10 May 2013. Retrieved 12 November 2014. ^ Holloway, Bruce (18 November 2013). "Making sense of the Wanderers SC name". The New Zealand Herald. Retrieved 12 November 2014. ^ "Expanded ASB Premiership confirmed". The New Zealand Herald. 22 August 2014. Retrieved 13 November 2014. ^ "Brett Angell appointed Head Coach of Hawke’s Bay". Hawke's Bay United Football. Retrieved 12 November 2014. ^ Hepburn, Steve (20 June 2014). "Fridge coaching Southern United". Otago Daily Times. Retrieved 12 November 2014. ^ "Hedge appointed coach of the reserve side". Wellington Phoenix FC. 21 October 2014. Retrieved 3 November 2014. ^ Hallett, David (30 November 2011). "Canterbury United's Kamo unlikely for first round". The Press. Retrieved 2011-11-30.